And by "catch 'em all", I mean all the players who would definitely love this game! I really need to figure out a way to get more eyeballs onto this project. The only way I can think of is to finish the pre-alpha, iron out the kinks, hand that to Let's Players who've played BGP before, then construct the alpha build, polish the beginning areas, and hand that to as many Let's Players as possible. Check this week's devlog for more details on how that effort is coming along. 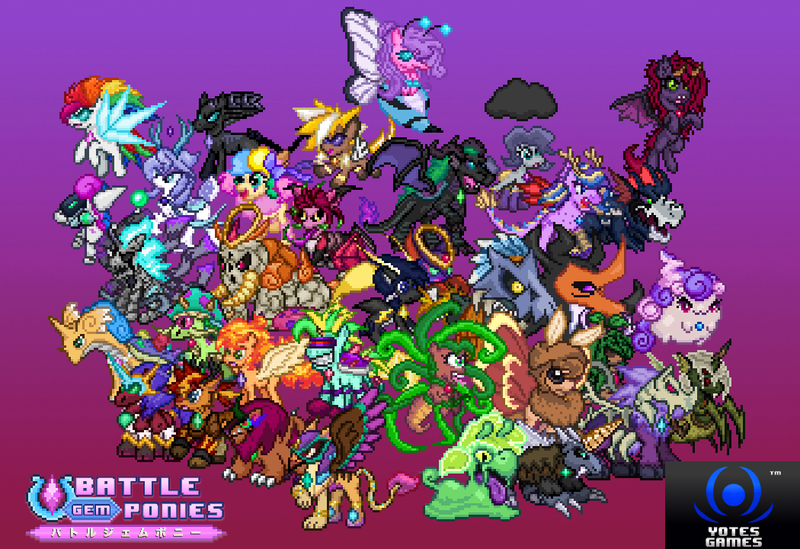 Support Battle Gem Ponies on Patreon! 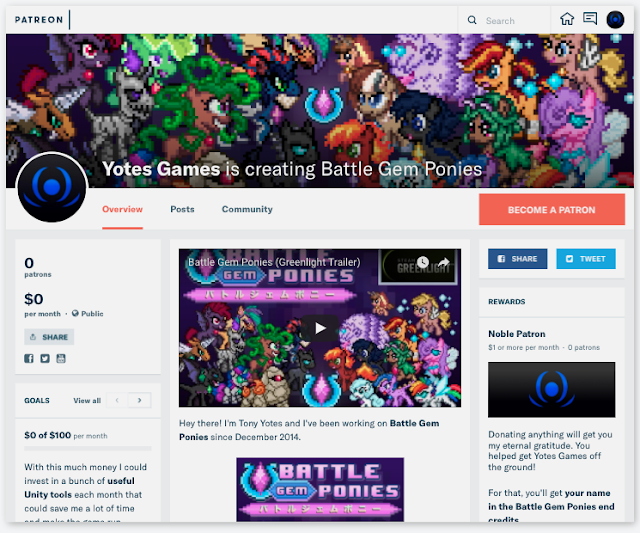 After tons of internal debating on whether I should do it or not, on a whim, I decided to create a Patreon today. To celebrate being over 150 weeks into development and on the verge of an Alpha build, I wanted to have some sort of morale boosting driving force to push me and the music team through the rest of development. I gotta imagine this is similar to how other devs feel when they launch a crowdfunding campaign. Only this one is entirely optional. It took all day to make and I think it turned out pretty nice. 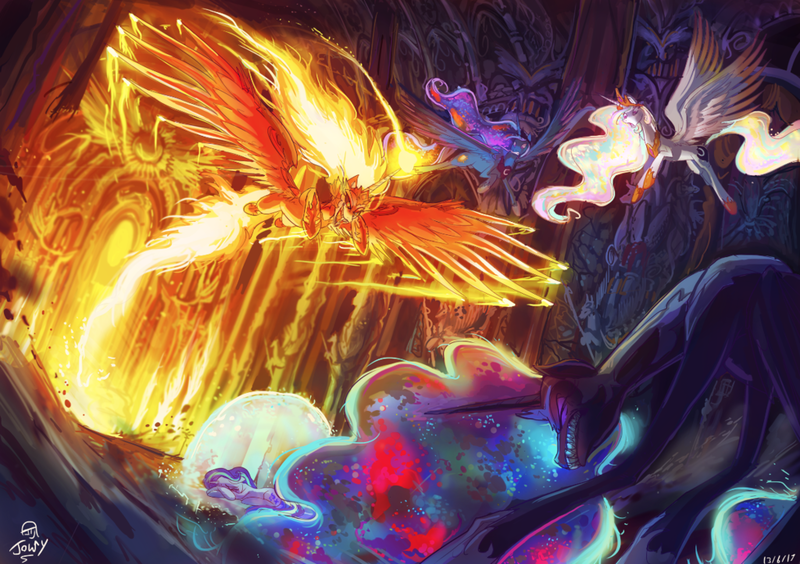 Colorful, detailed, yet concise, and with language conveying both lightheartedness and sincerity. Yes... I'm actually pretty proud of this. I just hope it's successful. If you could be so inclined, feel free to take a look around and consider becoming a patron to Yotes Games. 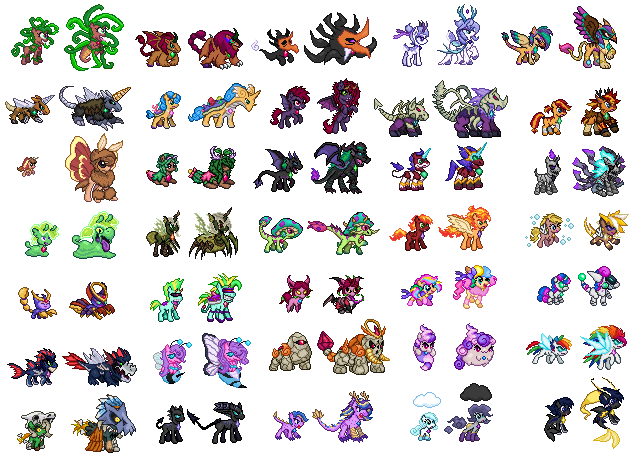 Finally finished everypony and their ultra forms! They're in need of cleanup, but sometimes you just gotta move onto the next step or the bigger picture will never be framed. Can't believe I've been on this for over 150 weeks now... Time to kick things into even higher gear to get this game out on time for a Spring 2018 release! This week is filled with tons of exciting news, updates on Yotes Games as a business, retrospection on previous games, plans for the future, and tons of inspiration for getting through the rest of the development of Battle Gem Ponies. Get a MAJOR gamedev update to make up for the weeks of silence below, on this week's devlog!